Want to know if someone entered your room? Sometimes a "Keep out" sign is not enough to keep out your siblings, so here we built a simple presence detector that lets you know if someone enters your room and how many times it happened. 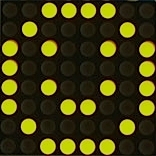 As a cherry on top, we added an LED Matrix that displays a happy face when the room is quiet, and the opposite when it's not! 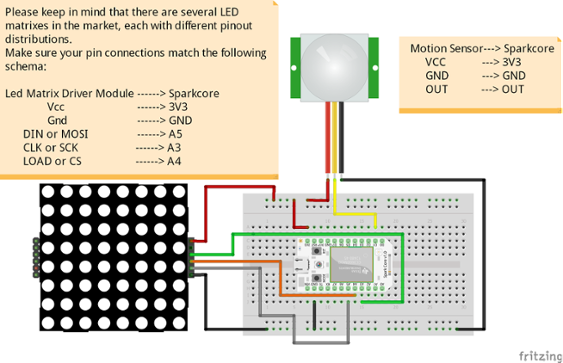 Please keep in mind that there are several LED matrixes in the market, each with different pinout distributions. 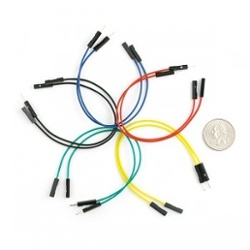 Make sure your pin connections match the following schema. 3. Set up your Dashboard. 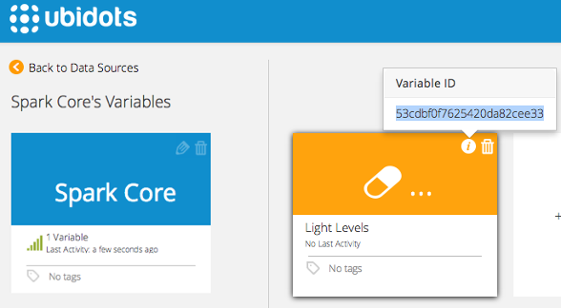 Login to your Ubidots account, create a Device source called “Spark Core” and then add a new variable called "Presence”. 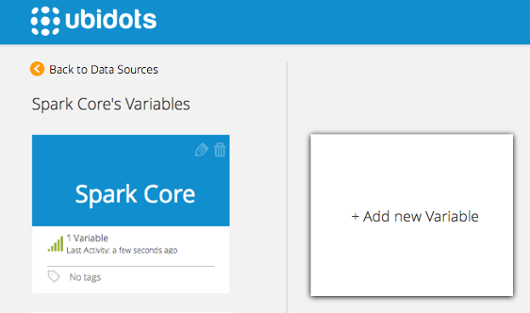 Go to the "devices" tab and create a device source called "Spark Core" by clicking in the 'plus' button located in the upper right corner. Click on the created device and then “Add New Variable”. Pro Tip: take note of your variable's ID, we need it later. 3. Create a token under "My profile" tab. 5. Go back to the "Dashboard" tab and add a new widget by clicking on the orange "plus" button. 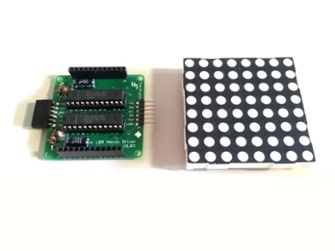 First choose Indicator then Sparkcore as Datasource and Presence as Variable. 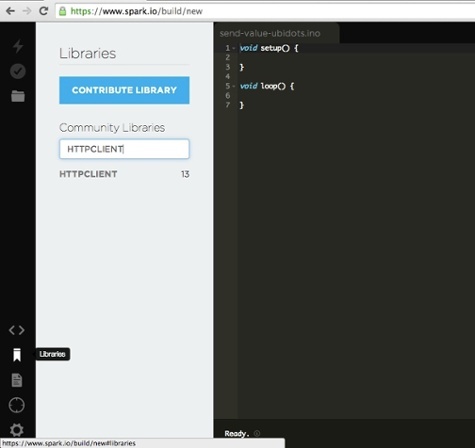 For the second "widget" choose "Statement"--> Sparkcore --> Presence --> Sum --> Today. The sum of Presence will tell you how many times the sensor has been activated. 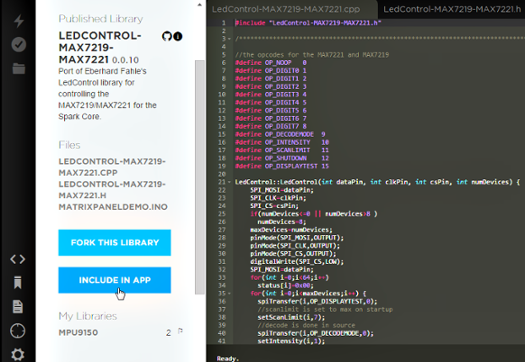 We will create a new app called "Presence" in the Spark Build IDE, then we need to include in our app the "HTTPCLIENT" Library to send the data to Ubidots and the "LedControl-MAX7219-MAX7221". Do not forget to include your Ubidots token and variable's ID into the code. Create a new App called "Presence" and then click on the "Libraries" icon and look for an HTTP library called “HTTPCLIENT”. 2. 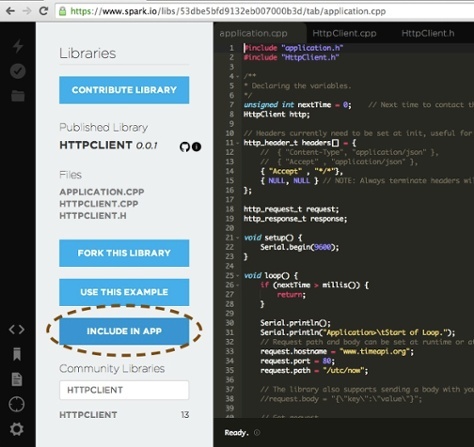 Click on the “HTTPCLIENT” library and then click onthe button “INCLUDE IN APP”. 5. Flash the code, wait until the core stops flashing magenta and we are done! 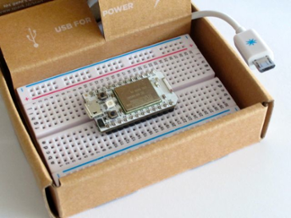 Do you have an IoT project in mind? Make it happen in days, not months! Content originally posted in Ubidots Blog on December 9, 2014.